When Oberammergau (Germany) & the marathon skiing elite woke up this morning, a 20 cm layer of fresh snow & further snowfalls already awaited them. So already before the start, it was clear: The König Ludwig Lauf 2019 is going to be a slow & hard race! 50 km of Classic Technique passing the famous castle Linderhof were standing on the program. Morten Eide Pedersen (NOR) & Lina Korsgren (SWE) turned out to be the best fighters in this snow flurry of FIS Worldloppet Cup stage 3. 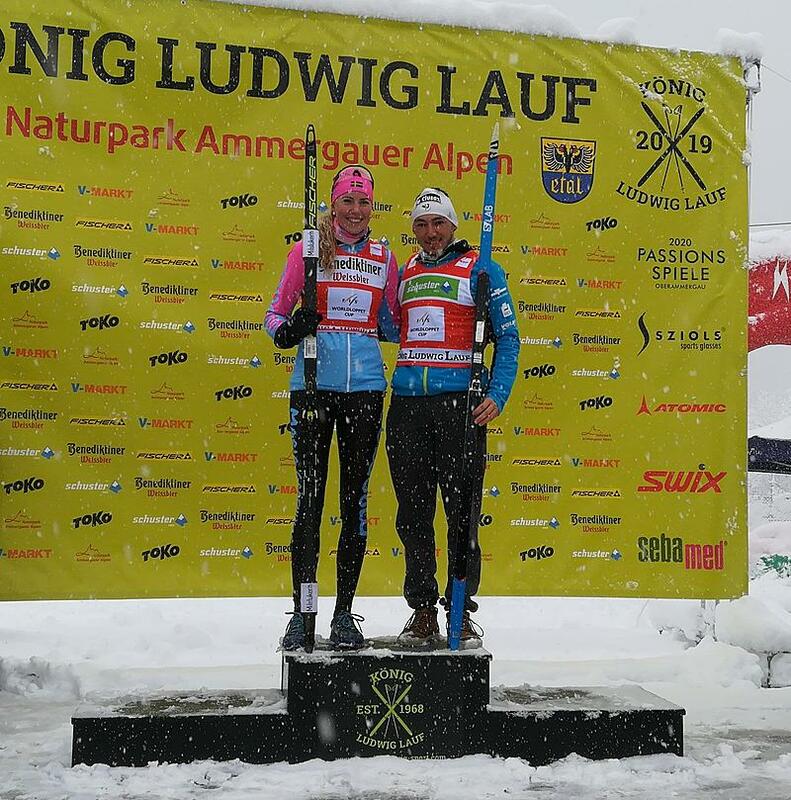 Together with thousands of popular skiers the marathon skiing elite of the FIS Worldloppet Cup accepted the challenge of fighting the snow flurry of Oberammergau at 2019’s König Ludwig Lauf. The German Worldloppet race today (3.2.2019) has been hosting the FIS Worldoppet Cup for its 3rd stage (after stage 1 in China & 2 in Austria the weeks before). After the cancellation of the Ski Classics race, Toblach-Cortina, some of the best marathon skiers in the world spontaneously travelled from Italy to Germany overnight to participate at the FIS Worldloppet Cup. Two of them, in the end, won the snow-battle. Unfortunately, the Ski Classics had to cancel their event – Toblach-Cortina – this weekend because of avalanche hazard, so some of the elite-team skiers wanted to late register for the König Ludwig Lauf in the German Oberammergau. But it turned out, that the main streets between Italy and Bavaria were closed because of snow chaos. Anyhow, the Norwegian pro-team skier from Lillehammer, Morten Eide Pedersen managed to come to Oberammergau, and his journey paid off: After 50 km of exhausting double poling through the woods and fields around Oberammergau, slowed down by masses of falling snow, without good sight, Pedersen finally was able to get in front of the rest of the leading group and winning the König Ludwig Lauf 2019 in a time of 2:28:19. Not even 2 seconds behind him, the next pro-team skier & marathon skiing legend, Stanislav Rezac from the Czech Republic, who grabbed the second place. Tarantola Damien from France sprinted to place 3. “Sitting in the car for hours in the traffic jam at the Brenner Pass (Austria) was totally worth it for me now.”, says the happy winner from Norway, Morten Eide Pedersen. “The snow was slowing down so much at the front of the group, so we needed everyone to ski in front once. It has been very slow 50 km.”, he sums the 3rd FIS Worldloppet Cup stage up. Before this morning, everyone thought, that the victory in today’s ladies competition is already secured for Maria Gräfnings from Sweden. 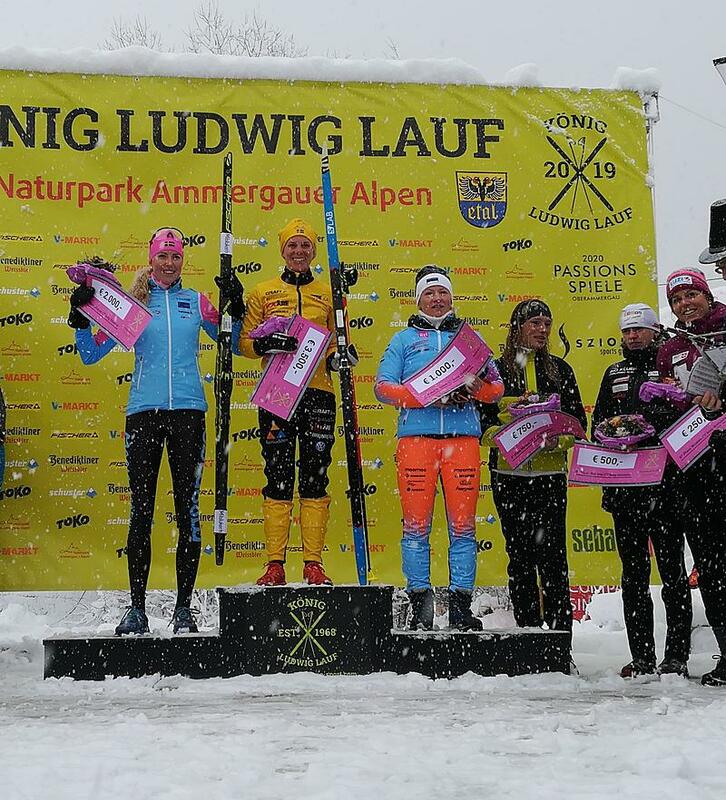 She won the first two stages of the FIS Worldloppet Cup and was the top-favourite for today’s 3rd stage. But in the morning hours, another Swedish skier entered the race. 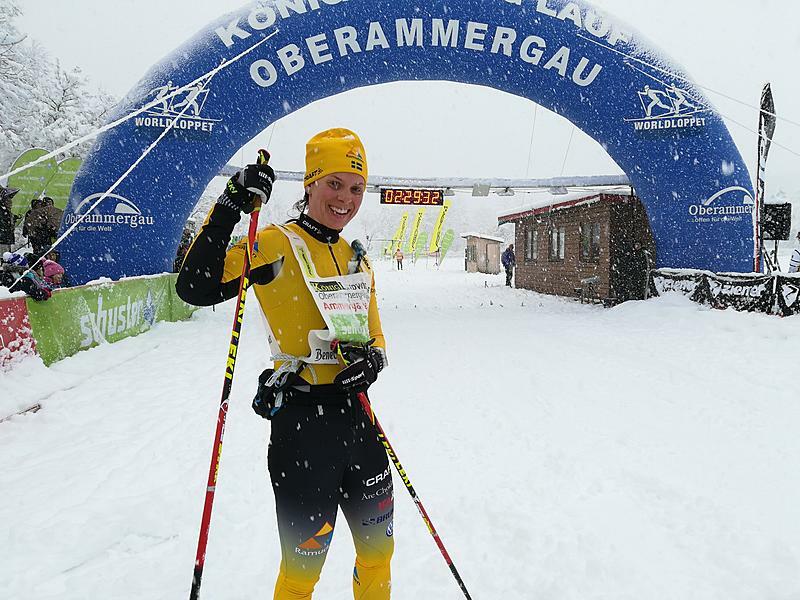 Lina Korsgren, the winner of last season’s Vasaloppet, made her way from Toblach to König Ludwig Lauf and was ready for the snow-fight. Both Gräfnings & Korsgren where able to follow the best men almost until the finish in Oberammergau, but in the end, it was Lina Korsgren who crossed the finish line as the fastest woman, seven seconds ahead of Gräfnings, who finished 2nd. The two Swedes finished only one minute behind the winning men! The 3rd place is going to Estonia, to Tatjana Mannima. On the third race day of the FIS Worldloppet Cup, Maria Gräfnings is expanding her overall lead with another 80, having 280 points in total now. She is followed by Tatjana Mannima (140 points) and now Lina Korsgren (100 points). 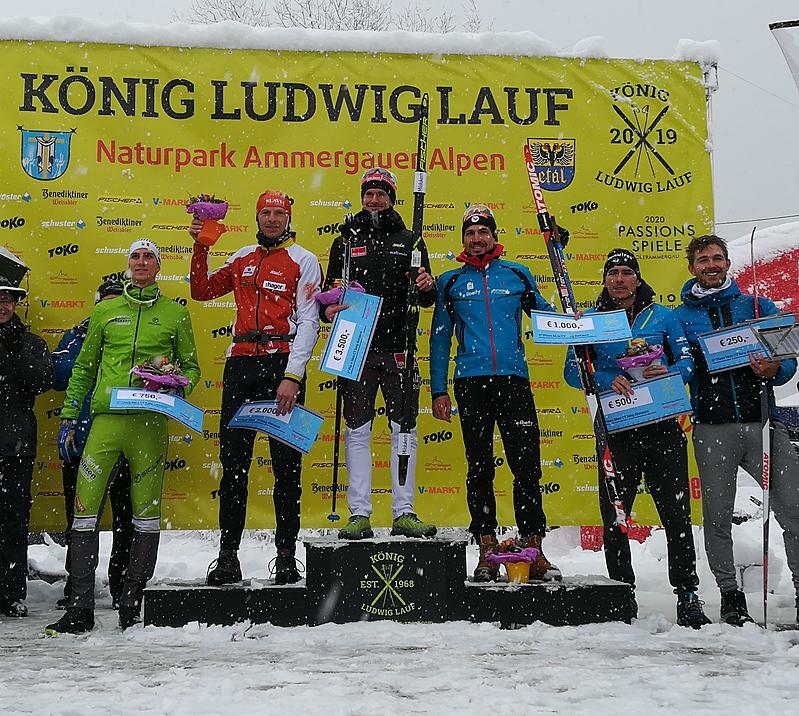 In the men’s overall ranking Gerard Agnelled overtook the overall lead with 109 points, directly followed by his teammate, Loic Guigonnet, who has 105 points. Bastien Poirrier is following them with 102 points. The FIS Worldloppet Cup is going to continue next weekend in France with the second skating race of the season, the Transjurasienne, taking place on the 10th of February.